While he may have invented a good bit of the material in his Historia, Geoffrey, like other medieval historians, also drew freely on the work of those who had preceded him (and later historians would draw as freely on Geoffrey himself). Compare his opening description of the island of Britain, for example, with some of those sources below. The portrait of Pliny is taken from a 1635 printing of the Historia Naturalis; the initial is from a 1559 printing. Both of these editions are in Rare Books and Special Collections. To see how the description of Britain looks in these and other old printings in the UBC collection, go to the page Pliny at UBC. You can find the Latin text online at Bill Thayer’s LacusCurtius site, a large site devoted to images and texts of the Roman world. For still more pictures: there are 3 images from a 16th-century printing of the Naturalis Historia on the Smithsonian's site for its wonderful Voyages exhibit. The Pliny images are in the Journeys over land and sea: Botany and zoology subsection. The island of Britain, situated on almost the utmost border of the earth, towards the south and west, and poised in the divine balance, as it is said, which supports the whole world, stretches out from the south-west towards the north pole, and is eight hundred miles long and two hundred broad, except where the headlands of sundry promontories stretch farther into the sea. It is surrounded by the ocean, which forms winding bays, and is strongly defended by this ample, and, if I may so call it, impassable barrier, save on the south side, where the narrow sea affords a passage to Belgic Gaul. It is enriched by the mouths of two noble rivers, the Thames and the Severn, as it were two arms, by which foreign luxuries were of old imported, and by other streams of less importance. It is famous for eight and twenty cities, and is embellished by certain castles, with walls, towers, well barred gates, and houses with threatening battlements built on high, and provided with all requisite instruments of defence. Its plains are spacious, its hills are pleasantly situated, adapted for superior tillage, and its mountains are admirably calculated for the alternate pasturage of cattle, where flowers of various colours, trodden by the feet of man, give it the appearance of a lovely picture. It is decked, like a man's chosen bride, with divers jewels, with lucid fountains and abundant brooks wandering over the snow white sands; with transparent rivers, flowing in gentle murmurs, and offering a sweet pledge of slumber to those who recline upon their banks, whilst it is irrigated by abundant lakes, which pour forth cool torrents of refreshing water. 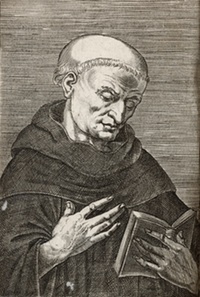 There are many excerpts of this text online: see, for example, The Medieval Sourcebook: Gildas. There is a Latin version online as well: Gildas: de excidio et conquestu britanniae. 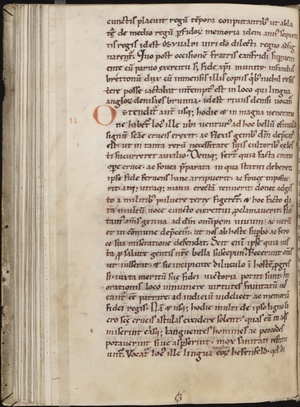 You can see a medieval translation of Bede into Old English at Oxford’s Early Manuscripts at Oxford University project; the manuscript is Corpus Christi College 279B. Bede’s World is a museum in Jarrow devoted to Bede's period: you might find their website interesting. The full text is available online in translation in the Medieval Sourcebook: Nennius. The island of Britain is so called from one Brutus, a Roman consul. It reaches from the south-west northward, and lies to the west. It is 800 miles long, 200 broad. In it are twenty-eight cities and headlands without number, together with innumerable forts built of stone and brick, and in it live four nations, the Irish, the Picts, the Saxons and the British. It has three large islands. One of them lies towards Armorica, and is called the Isle of Wight; the second is situated in the middle of the sea between Ireland and Britain, and is named Eubonia, that is Man; the other is situated at the extreme edge of the world of Britain, beyond the Picts, and is called Orkney. So the old saying runs, when rulers and kings are mentioned, "He ruled Britain with its three islands." In Britain there are many rivers, that flow in all directions, to the east, west, south and north. But two of the rivers excel beyond the rest, the Thames and Severn, like the two arms of Britain, on which ships once travelled, carrying goods for the sake of commerce. The British once occupied and ruled it all from sea to sea. To see how Britain was imagined about a century after Geoffrey’s own period, visit the British Library’s online map showcase to see Matthew Paris’s Map of Great Britain, drawn by a monk of St. Alban’s around 1250. The next few examples show you selections from Geoffrey next to some of his sources: these are all passages that we discussed in class. They show Geoffrey using those sources in various ways. The last example shows you the Latin originals in both cases, so that you can see how close, in this instance, his borrowing is. [Britain] has five languages, just as the divine law is written in five books. These are the English, Welsh, Irish, Pictish, and Latin languages: all are devoted to examining and setting forth the knowledge of the highest truth and of true sublimity – but Latin, by means of the study of scriptures, has become common to all. Lastly, Britain is inhabited by five races of people, the Norman-French, the Britons, the Saxons, the Picts, and the Scots. Of these the Britons once occupied the land from sea to sea, before the others came. Then the vengeance of God overtook them because of their arrogance and they submitted to the Picts and the Saxons. The Romans saw and avoided [the stakes], so the barbarians, being unable to resist the charge of the legions, hid themselves in the woods, from which they made constant sallies and frequently did the Romans great damage. As [Caesar] cruised up the Thames in the direction of the above-mentioned city of Trinovantum his ships ran upon the stakes which I have described and so suffered their moment of sudden jeopardy. Thousands of soldiers were drowned as river-water flowed into the holed ships and sucked them down. When Caesar discovered what was happening he made every effort to furl his sails and then ran ashore as fast as he could. Those survivors who by the skin of their teeth had escaped from so great a peril now clambered with Caesar on to dry land. Alban, for charity’s sake, and in imitation even here of Christ, who laid down his life for his sheep, protected a confessor from his persecutors when he was on the point of arrest. Hiding him in his house and then changing clothes with him, he gladly exposed himself to danger and pursuit in the other's habit. Between the time of his holy confession and the taking of his blood, and in the presence of wicked men who displayed the Roman standards to the most horrid effect, the pleasure that God took in him showed itself: by a miracle he was marked out by wonderful signs. Thanks to his fervent prayer, he opened up an unknown route across the channel of the great river Thames – a route resembling the untrodden way made dry for the Israelites, when the ark of the testament stood for a while on gravel in the midstream of Jordan. Accompanied by a thousand men, he crossed dry-shod, while the river eddies stayed themselves on either side like precipitous mountains. Albanus, glowing bright with the grace of charity, first hid his confessor Amphibalus in his own house, when the latter was closely pursued by his persecutors and on the point of being taken; and then changed clothes with him and offered himself to Death’s final parting, thus emulating Christ who laid down His own life for His sheep. Igitur rursum miserae mittentes epistolas reliquiae ad Agitium Romanae potestatis virum, hoc modo loquentes: ‘Agitio ter consuli gemitus Britannorum;’ et post pauca querentes: ‘repellunt barbari ad mare, repellit mare ad barbaros; inter haec duo genera funerum aut iugulamur aut mergimur;’ nec pro eis quicquam adiutorii habent.